I don’t know if everyone is like this, but getting my senior pictures done was so nerve-wracking for me. I guess it was because I didn’t know what to expect and I wanted them to turn out perfect. 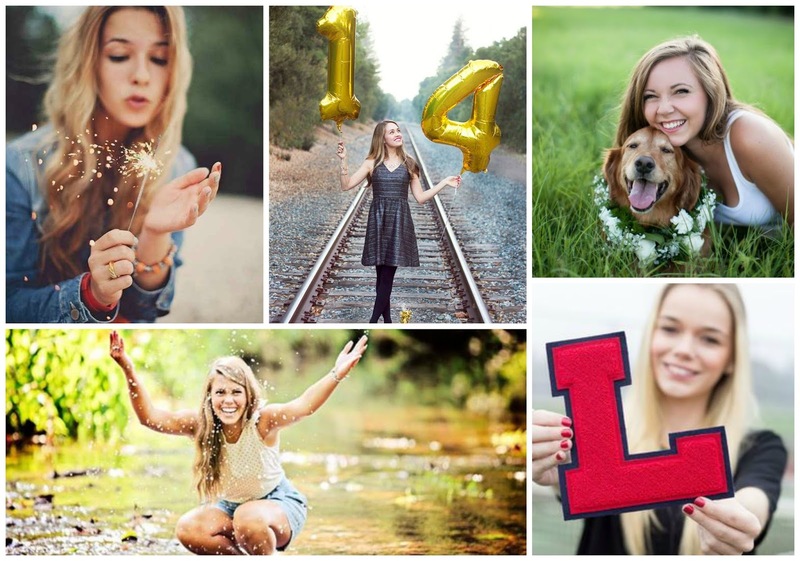 I know I would have loved a post with some tips for how to make your senior pictures great, so I decided why not make my own and share it! My biggest tip is to wear something classic, something you will not regret wearing in a few years. You want to wear something that isn’t showing off a lot, something you would be comfortable showing your family and friends now and for years to come. But also make sure you wear something that is you, something that matches your personality. I suggest bringing two outfits. Most photographers will allow you to bring at least two outfits. This will allow you to have one casual and one dressy outfit. For example, for my two outfits, I wore jeans and a cute top for one and a dress for the other. When choosing what to wear make sure to think about your background. If you are taking your pictures in a field, don’t wear green or if you are taking your pictures at a barn, don’t wear brown. You don't want to blend in with your background, you want to stand out! If you do your pictures later in the year and you know where you are going to college then bring your college t-shirt. This will be a super cute photo to represent the next phase in your life. 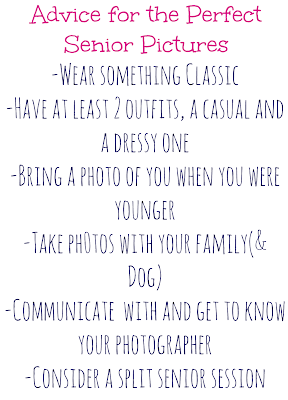 One last tip, if you are taking a formal photo wearing the black cape, then make sure you bring a tank top or sleeveless shirt to wear under it as well as pearls if you want. Everyone wants unique senior pictures, the key is to bring some props that represent who you are! Here are a few suggestions of some things that will make your pictures just a little bit better. I really wish I had brought a younger picture of myself. I love the look of holding an old photo to show how much you have grown and changed. Another good idea is if you are involved in sports to bring something that represents the sport or your accomplishments in that sport. For example, if you play tennis, you could bring a tennis racket or a medal from a tournament you won. If not, you can always bring your letterman if you have one! If you are involved in a club you could bring something that represents that organization. For example, someone really involved in the book club may want to bring a book. Most importantly, bring your family! Take photos with your mom and dad and sister or brother, I promise you these will be some of your favorite photos that you will cherish forever. If you are a dog lover, I would definitely consider bringing your dog or whatever pet you have! I think balloons are always fun for pictures. You could do number balloons with the year you graduate or just some fun big balloons. I definitely think you should have something that says what class you are, you could simply decorate a cute poster board. 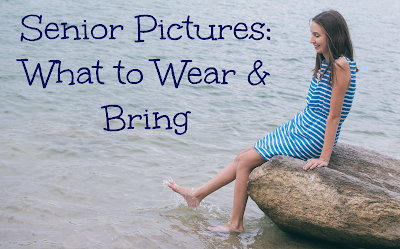 Hopefully, these tips will help make your photos perfectly representative of you! If you really want your photo session to turn out good, than the key is to communicate with your photographer! They will have excellent recomendations for a location as well as photo and outfit ideas. You can not afford to not use them as a resource! 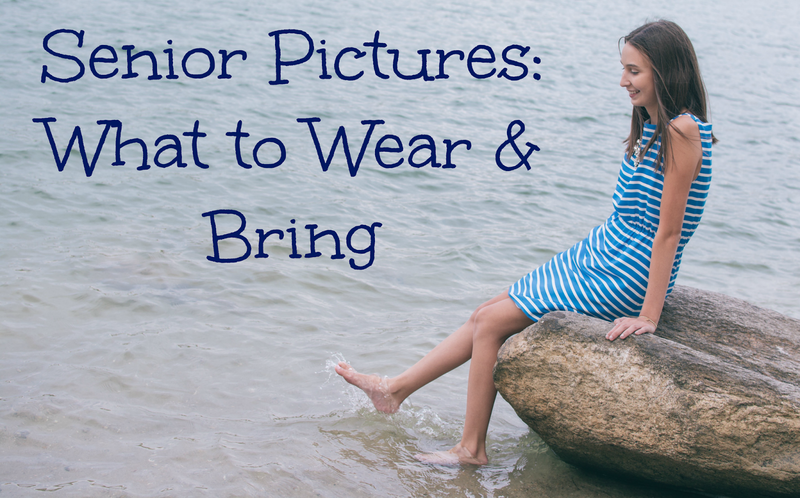 Choosing a location that you love and are comfortable in will make your photo session go much more smoothly. Another key thing if you have not booked your photo session, you must book early. Many photographers will get booked up quick. This is something I definitely wished I would have heard about or considered. It is the idea of doing a split senior session. One half is in the summer/fall where you do outfits. 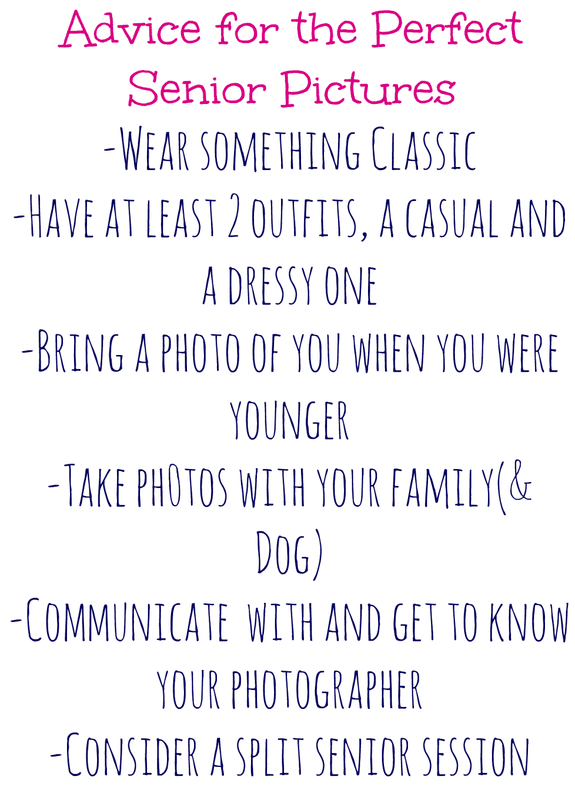 The other would be in the spring, where you would do cap & gown pictures as well as a pictures in your college t-shirt! This allows you to have so many great pictures to document senior year and the future. 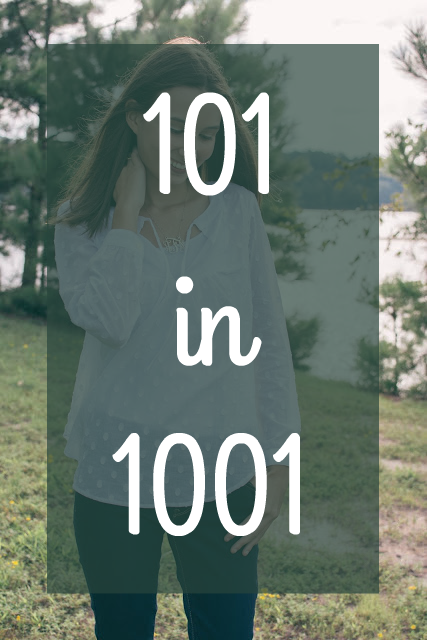 I hope this post was helpful for some of you! 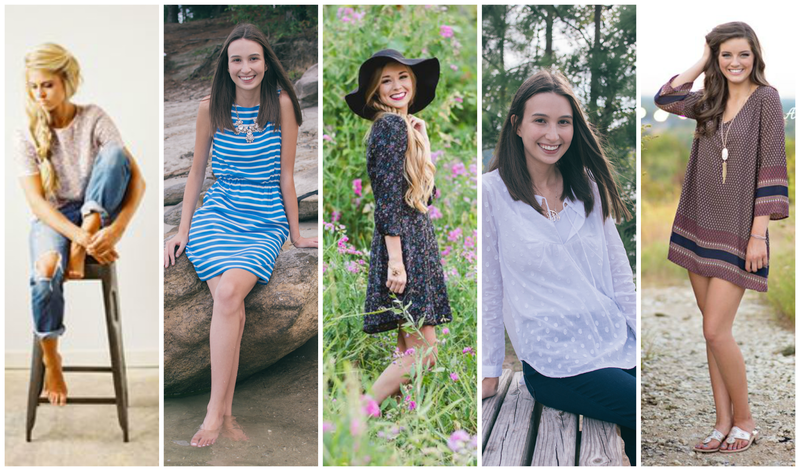 If you get your senior photos done this upcoming year, please send them to me; I would love to see them. Remember these photos will be perfect memories to come for so many years ahead, but they are just photos. Have a great time, it's a unique experience that deserves to be purely enjoyed! These are some great tips Ashley! Thanks!! Glad you enjoyed it!